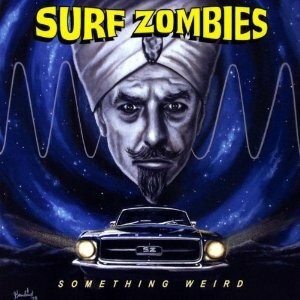 The Surf Zombies first came to my attention by the way of a “Rock and Roots” CD sampler. The split second I saw the song title “El Funebre (The Hearse)” and the band’s name on the track listing, I knew I was in for a treat. Listening to it confirmed my expectations and immediately got me hooked on the band’s work. So when the Freaky Tiki Surf-ari started, I knew I just had to include them. “El Funebre (The Hearse)” opens with a few Spanish-sounding chords which lead to a classic-sounding surf opening. The build-up drums signals the coming of a fast, rocking beat with occasional pauses for a reprise of the opening chords followed by numerous guitar variations and the buildup to more cords. Wavy cord leads to the big (but brief) finishing fadeout. “Dead Man’s Alley” kicks things off with a powerful guitar beat backing another guitar and rattlesnake-like percussion. Cymbals come into play sometime later, as do echo effects at the end. I want to make a spaghetti western, just to use this song as the theme! “I Fell In Love With A Teenage Vampire” makes great use of two guitars after the fast, medium volume guitars and drums get things going. It gets especially rocking near the end. Twilight wishes it could be as cool as this song. A few select cords lead to heavy, steady guitars and drums in “Road Rage.” There’s also a fake “ending,” then it gets going again with one guitar going wild. This track evokes the feeling of a long trip down a desert highway, and how butts will be kicked when the destination is reached. “50cc” starts with a single, heavy guitar and drums (with occasional cymbal) that builds in speed and intensity, all backed by an organ. It’s like someone or something closing in on its destination or prey. A wavy guitar appears before the organ returns in order to lead to a classic surf ending. The guitar work of “The High Rip” is somewhat lighter than that of the above song, but it’s must faster and cymbals play a more active role here. Things get lighter and slower at one point, but soon speed up and the guitars then show a rock influence. This becomes a recurring part of the song and helps reinforce the sense of speed and urgency. I particularly enjoyed how the organ was used to simulate an idling motor at the end. Heavy medium guitars and drums give “The Buzzard Hop” a sinister, but danceable feel and a lighter guitar appears about two minutes in. These seemingly contrasting elements actually go very well together. This track feels like a fusion of the band’s Kustom Kulture and horror surf style songs. The titular track, “Something Weird” (named for the famous-or is it infamous?-cult video company, which is named for the odd film of the same name) has a heavy introduction with reverb and slow drums, then guitars kick in over the drum beat. They go through several variations and later return to drum break of the opening for very mysterious feeling. Reverb punctuates the guitar notes to great effect, and pounding drum beats are used for “breaks” of sorts. Things lighten up a bit towards end, but then gets faster and the guitars start really wail. Fast percussion and peppy guitars form the intro of “Don’t Let the Admiral Out,” with both the drums and guitars sometimes slipping into quick, infectious breaks. A sense of power enters song after the second go at the opening style, plus the guitars get to crank things up. In contrast, “Candy Cigarettes” is very sweet and light in its use of guitar and drums, which are soon coupled with an even sweeter heavy-pitched sound. It stops for fairly “normal” guitar and drums break, but soon gets sugary sweet again and the guitar eventually reasserts itself at the fadeout. It’s definitely an interesting and fun change of pace. The lone guitar of “Alien Eyes” soon gives way to a faster beat of guitars and drums. It slows down and adds cymbals at one point, only to get faster and more rocking for the remainder of the song. There’s very familiar “surf” feel to this, especially the guitar riff used with the pounding drums. Speaking of surf, “Surfin’ Ghoul” uses fast percussion to evoke building waves. This is soon followed by medium guitars and (of course) plenty of reverb. Cymbals added in as well to complete the mix. In “Extended Tour,” brief drum bursts and guitars bring us into a cool surf beat. Said guitars get to really shine here and often work their reverb magic. The organ pops in to underscore certain points, but mostly blends into the background just under the drums until it takes over for the final part of the song. “Leonard” uses a heavy, slow guitar to lead into similar-sounding drums and further guitar work. The surf influence soon makes its presence known and makes for a pounding, catchy whole. Medium guitars and fast percussion have exotic feel to them in a fast-paced, pounding tune called “Mind Worm.” There’s a very 60’s-sounding feel to it at times, which alternates with rocking guitars and steady drums. Spacey sounds get layered for the end, which is appropriate given that most mind-controlling, wormlike beings tend to be of alien origin in horror and science fiction tales. “Crawl Space Crawl” has slow and heavy guitars and drums, but with a “bouncy” feel emphasized by the occasional use of reverb. Cymbals and guitar variations are used to great effect here, especially at the ending slowdown. Fast drums and guitars underscored by other percussion gives “Incognito” a decidedly sneaky feel. 60’s style guitar work appears at times here only to be engulfed by fast, heavy guitar and drums. There’s a rather downbeat feel to reverb here, presumably due to the seriousness of spy work. The slow guitar start of “Electric Skull” speeds up somewhat and light, steady drums are soon added. The two guitars get a little more adventurous as things progress. Similarly, the reverb opening of “Rockabilly Boogie Man” gives way to fast rockabilly/surf guitars and drums. The awesome drum solos are followed by even more fast guitar goodness. “The Zombie Stomp” use slow, medium volume drums and guitars, with the two contrasting guitar styles making things more interesting. Likewise, “Aqua Waltz” uses slow, heavy percussion and sound effects joined by very slooooow guitars. This gives the feel of dreaming or floating in ocean waves and is a great way to close out the album. Effectively shifting through and combining various styles and genres, the Surf Zombies have put together one hell of an album. Although several of the CD’s 21 tracks are relatively short, they’re all amazing and never wear out their welcome. So if you’re looking for something new in horror surf, I highly recommend that you look into the Surf Zombies. You won’t be disappointed! Special thanks to The Surf Zombies for the review copy!